While working on the Scheduler POC for the article BizTalk Server : Scheduling Orchestration using Trigger Message, received below error while deploying the application using the visual studio. 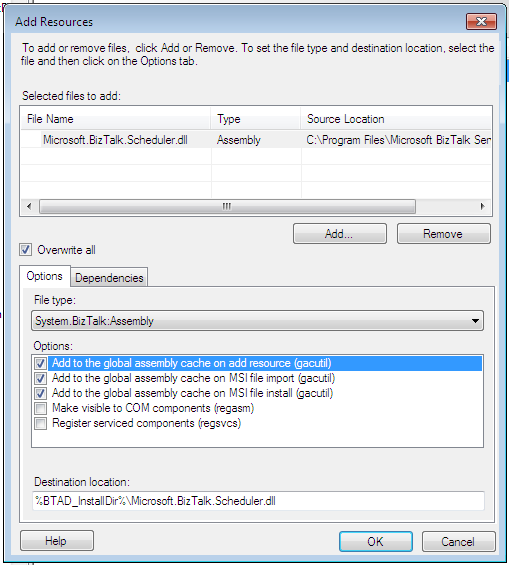 It happened because Microsoft.BizTalk.Scheduler assembly which is used by Scheduled Task Adapter was missing in the GAC . Welcome to second Interview of the series, today's BizTalk Expert is Leonid Ganeline. With 10+ years BizTalk Server experience Leonid is working as a BizTalk Developer, Architect, and System Integrator. He got awards: The Microsoft Most Valuable Professional [MVP] Awards 2007, 2008, 2009, 2010, 2011, and 2012 in BizTalk Server; The Microsoft MVP Award 2013 in Microsoft Integration. Leonid is a Moderator of the BizTalk Server General forum on the Microsoft MSDN site, and author of the Microsoft TechNet articles. Leonid: I was born on Lake Laberge near Whitehorse, then my family moved to Madagascar, then Uganda, then Oman, then Paris, etc. etc. Now I have settled down into Vancouver. I was pilot, accountant, hunter, base jumper, cook, and now I am a programmer. Leonid: BizTalk is useful when you need a separate integration platform, if you can afford a separate integration team (see a Conway's low). In this regard it competes with IBM Websphere MQ/ESB and Tibco platform. BizTalk useful if you have a zoo of different systems. Legacy systems, monolithic systems, custom database oriented systems. Weird and old protocols and data formats as EDI, FTP, SOAP. Leonid: We see an explosion of new technologies in area of distributed systems. New ESB implementations in different language platforms as Mule ESB, Spring Integration for Java, as NServiceBus, Rebus for .NET, Zato for Python. New message brokers and queues: RabbitMQ, ActiveMQ, Azure ServiceBus. Completely different approaches as ZeroMQ, Netty. New powerful serialization technologies as JSON, MessagePack, Protocol Buffers. New communication protocols as torrent, mesh. So new systems are distributed, they don't need a separate integration layer because they can communicate each other out-of-box. Right? Not really. You still need to design and implement intersystem communications. But now it is a matter of generic development, commodity programmer skills. What about the BizTalk Server and similar systems? They would happily work for years as all legacy systems do. If it ain't broke, don't fix it. Microsoft still supports BTS on new OS, SQL and Visual Studio versions, so don't worry. Mahesh: What as per you is must to know to become an Integration(BizTalk) Expert? What should be approach to get sound knowledge in Biztalk? Leonid: Just work with it. Do your mistakes, do your stupid errors. More errors means more experience. Leonid: MSDN BizTalk forum is a great place to communicate, to make sure you are not the last BizTalk developer in the world. Leonid: It tooks you a minute to get all certification answers in internet. But the main problem is the BizTalk is a large system and it is not possible to cover all main BizTalk aspects in one exam. Moreover, the question coverage is too far away from the real life, IMHO. For example, the BizTalk Business Rule Engine has a good coverage in the exam, but in I would hardly recommend to use BRE in production. So the short answer is the BTS certification is useless, sorry. Mahesh: Your suggestion to a newcomers? Leonid: Keep your hands out of BizTalk Server. Invest your time in new stuff. Thanks a lot Leonid, am sure many of us will be benefited from your insights and your journey is inspiring !!!!! !